Blotter: unnumbered; image number: LAR_BB1. "Be sure to protect your eyes with good light. 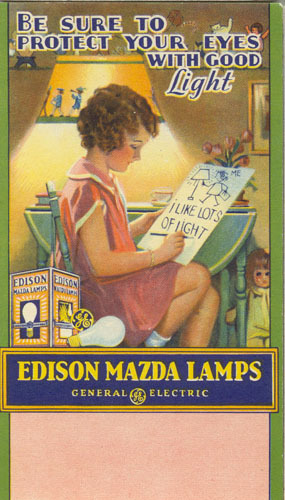 Edison Mazda lamps. General Electric." What is "good light?" The question of proper light levels has been debated for over a century and continues to generate heated discussions. The debate often boils down to one issue: is brighter better? The answer seems to be: it depends. The first users of electric light were accustomed to oil lamps and candles. Some urban residents used gas lighting wherein a typical gas jet produced about 16 candlepower. Thomas Edison deliberately designed his new incandescent lamps to give 16 candles so as to directly compete against gas, and this rating became a standard for many years. Sixteen candles roughly equates to the output of a modern 25-watt lamp. Lamp makers throughout much of the twentieth century pushed consumers to buy higher output lamps, arguing that low levels of light created eyestrain as users struggled to read or perform other tasks. Notice the child's drawing in this late 1920s blotter carrying the caption, "I like lots of light." And indeed, objective studies indicated that both productivity and safety increased with higher light levels in the home and workplace. By the 1970s "blankets of light" were commonly designed into buildings as discharge lamps with ever higher output became available; the "brighter is better" mantra reached a peak. However, soaring energy costs in that decade sparked a reevaluation of this policy as some engineers, designers and users began asking, how much light is enough? Research on this question continues in both corporate and academic laboratories. Human eyesight changes as we age, and current research indicates that an "adequate" light level for seniors can be up to seven times higher than that considered "adequate" by young people. Cultural factors can also play a role. For example, one designer with offices in both countries noticed that light levels in France were generally lower than in the U.S.
One result of the reevaluation is the growing design emphasis on "task lighting." 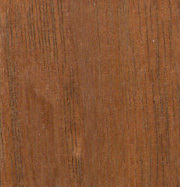 This refers to a practice of putting higher levels of light where needed, such as a desktop, and less light in other areas. Illuminating Engineering Society of North America, IESNA LIGHTING HANDBOOK, Ninth Edition, (New York, NY: IESNA Publications Department, 2000). P.A. Aspinall and J. Dewar, "Lighting and perceived guilt" in Lighting Research and Technology, 1980, V. 12, #3, p.140. M. Clay Belcher, "Cultural aspects of illuminance levels" in Lighting Design and Applications, February 1985, p.49. Taylor Moore, "Human Performance in the Spotlight" in EPRI Journal, September 1993, p.15.